The private shareholdings in the Berliner Wasserbetriebe (BWB) were bought back by the State of Berlin in late 2013. We wish to take this further and democratise both Berliner Wasserbetriebe and water policy as a whole, and so achieve transparent, socially just and environmentally sustainable water management in Berlin. This demands a complete return of the formerly part-privatised company to ownership of the State of Berlin. 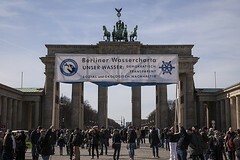 To this end, the Berliner Wassertisch has drawn up a draft water charter for Berlin. Our intention is to develop this draft further by means of a broadly-based debate within society. We wish to bring together all the different areas of expertise on the subject of water in our city, and to invite Berlin’s population to actively participate. We regard the Berlin water charter as the basis for statutory regulations and as a guide for Berliner Wasserbetriebe. When it comes to water policy, the buzzword in the EU is water scarcity. By looking at this from a purely economic angle, when a product is scarce the price should go up. This would be the case if water were to be treated as an economic good, which the Blueprint reminds us of in the very first page. By defining our mismanagement and over-pollution of water bodies both above and under ground as water scarcity, it has provided an opportunity for industry to provide new high-tech solutions – desalination, waste water re-use technologies, bottled water in flood and drought relief zones. Instead of looking at holistic ways of managing our water in a sustainable manner through changing agricultural and energy production choices as well as overhauling the decision making process by integrating actual citizen participation, the Blueprint prescribes the same medicine which has been proven to fail before. Even though two-thirds of the group of experts from all Member States (MS) working on agriculture and water, the European Commission (EC) as well as other stakeholders agreed that “cross compliance should be strengthened, broadened and better enforced in order to ensure positive effects on ecological status and achieve the Water Framework Directive (WFD) objectives”, the Common Agricultural Policy (CAP) reform did not propose any relevant measures.